While Planned Parenthood is the nation’s largest abortion provider, having performed 327,653 abortions in 2013, federally qualified health centers (FQHCs), which operate in service sites in both rural and urban locations, offer low-income populations health services similar to those provided by Planned Parenthood, but do not perform abortions. 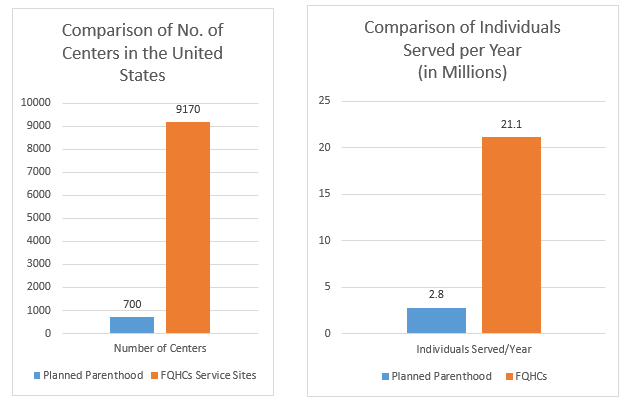 There are over 13 times more FQHC Service Sites (9,170) nationwide than there are Planned Parenthood centers (about 700). FQHCs serve 21.1 million individuals per year, nearly eight times more individuals than are served by Planned Parenthood centers (2.8 million). For definitions of FQHCs and service sites, see http://www.hrsa.gov/grants/apply/assistance/Buckets/definitions.pdf. “Key Health Center Data by State, 2013: Federally-Funded Health Centers Only,” National Association of Community Health Centers (NACHC). http://www.nachc.com/client/2013%20Key%20facts%20by%20state%20data.pdf (accessed July 30, 2015). GAO “Federal Obligations to and Expenditures by Selected Entities Involved in Health-Related Activities 2010-2012” (Mar 2015). http://www.gao.gov/products/GAO-15-270R (accessed July 30, 2015).